So, you want to be on the first page of Google? Of course you do! And so does all of your competition. But, let's take a look at what it actually means to be on the first page of Google and see what happens when you perform a search on Google. 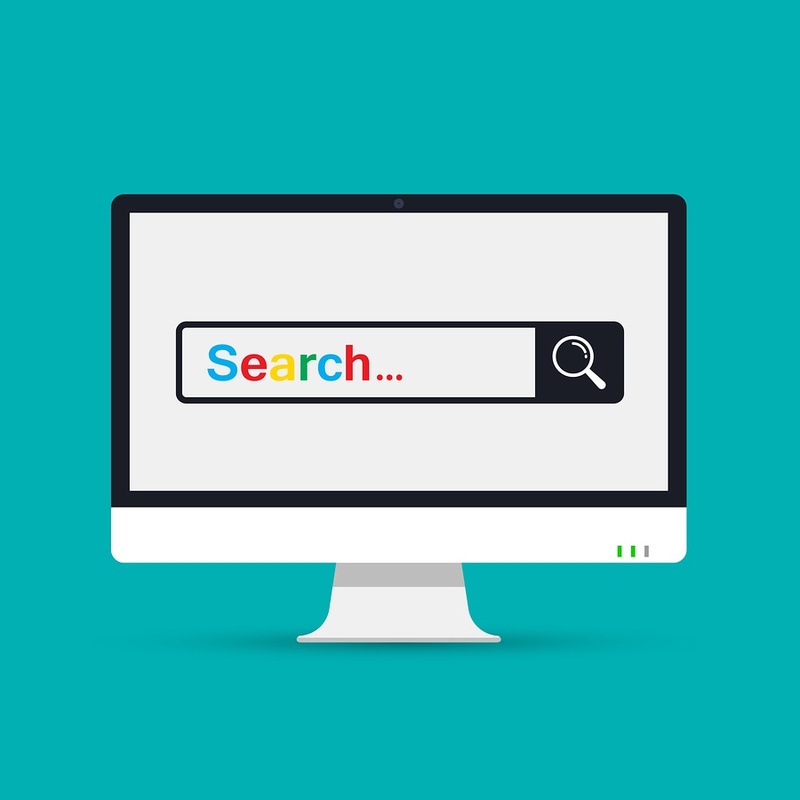 To find out the best ways to get your business to the first page of Google, you must first learn what happens when you perform a Google search. 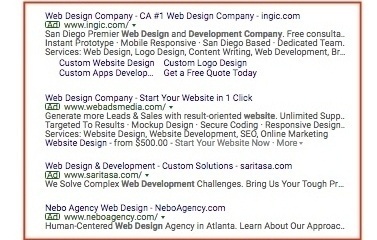 As you can see in the example below, I entered in the keyword phrase "web design company" that is pretty relevant to our business. To be first in any of the sections requires a different strategy and each section produces different returns on your time and resources invested. The best way to be on the first page of Google is to determine which section will provide the largest and most qualified number of leads while still producing a reasonable return on resources invested into that strategy. It shouldn’t be a surprise to anyone that Paid Advertising—Adwords—is at the top of the page. (It’s often on the bottom of pages, too!) Google’s business model is largely based on revenue earned from advertising and the prime real estate of a SERP goes to the companies that spend on advertising. While some people tell me that they never click on the ads, the reality is that there are a lot of people who do. How do I know this? Because if Adwords was not effective, then Google would not have earned $79.4 billion in revenue from paid advertising in 2016. At the highest level, it is largely dependent on the competition and the lifetime value of the client. For example, the cost of bidding on “car insurance” is $48. While this seems very expensive, when you factor in that auto insurance companies will cross-sell their new customers other forms of insurance, banking services, and investment services, the lifetime value of a new customer extends well beyond just auto insurance. So the competition for “car insurance” is very intense, which explains the high cost per click. The next largest component is your Quality Score, which is basically Google’s grade of you as an advertiser. While Google won’t tell you how they actually grade you, it’s pretty clear that the click-through rate (CTR) is a major component. And this makes sense—if your ad is clicked, Google gets paid. So the more your ad is clicked, the more revenue they get, and they are incentivized to give you a better grade so that your ad ranks higher/costs less. So one method to be on the first page of Google is to run a successful Adwords campaign. But depending on your industry, your marketing budget, the lifetime value of your client and, of course, the competition (price of the keyword), Adwords may not be the best solution for your company. 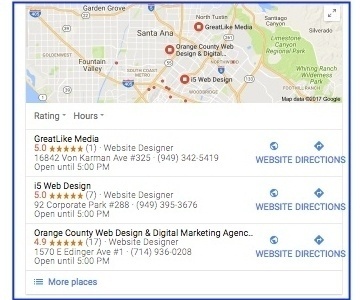 The Local SEO pack is your Google My Business page and appears for people who search for businesses near their location. Because I performed the search in Irvine, Google delivered three web design companies in and around Irvine, California. The key components of a higher-ranking Google My Business Page depend on the searcher's location, type of device, search term and previous search history. You also need to make sure that your business listing is up-to-date and accurate. Beyond the basics, one of the best ways to increase your chances of appearing in the three pack is to have reviews on your company. Of course, SEO best practices also apply to your local search optimization. Having a Google My Business Page is an absolute must if you are a small or mid-sized business. 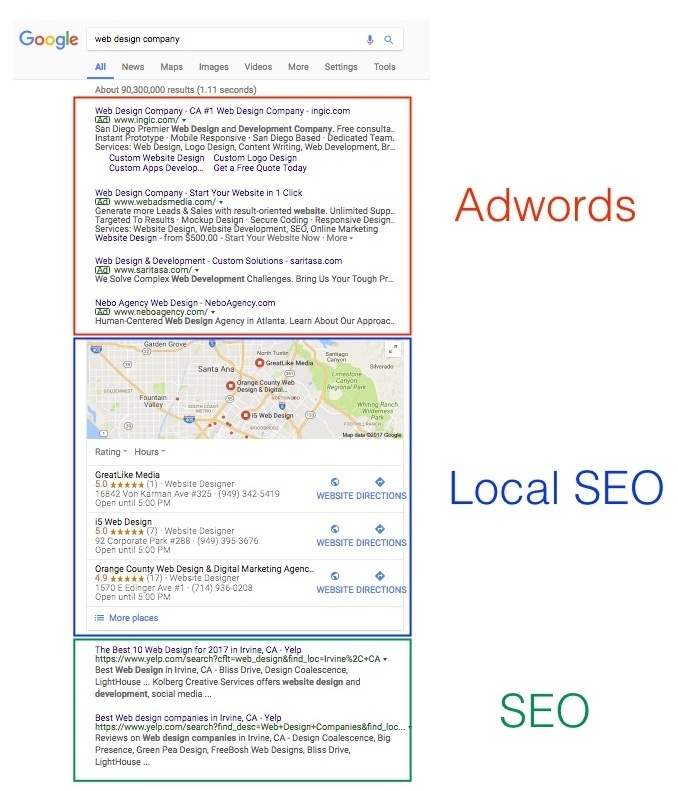 To learn more about Local SEO, check out our blog article. This is the traditional Search Engine Optimization that has been around for decades. Although SEO results most often appear below the fold, it is still important to rank high for targeted keywords, especially because, as we know, there are those people who refuse to click on Adwords. Most of the time, ranking for branded keywords (those keywords that include your brand name or some variation of it) is easier than non-branded keywords. If you want to get some insight about how competitive a keyword is and how much traffic it has, check out Google’s Free Keyword planner. Getting to the first page of highly competitive keywords can be very difficult. This is especially true when you have to compete against sites that have a lot of authority (like Yelp or Wikipedia) or sites that have had a web presence a lot longer than you. You should only pursue these keywords if you have a lot of authority on your website or have someone who really knows their way around SEO best practices. 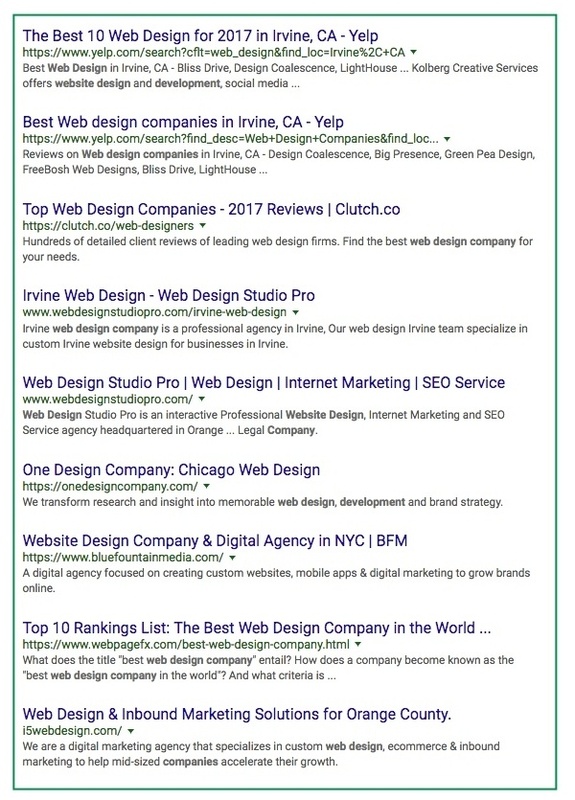 Just to give you an idea of how difficult it can be, it took us years for us to claw our way to to the first page for highly competitive and short tailed keyword like "Web Design Company". With today’s powerful computers, artificial intelligence and machine learning, there are fewer and fewer ways to “trick” Google’s search algorithm. However, there is a great way to improve your chances of ranking higher: blogging. With every blog post, you are generating new content and creating another URL for your site, which represents a new opportunity for Google to display your website in the SERP. When you blog, make sure that you write for humans first and the search engine second. Here are some great tips to follow if you are new to On-Page SEO. Each component of a Google Search Results Page requires a different strategy and tactic. You need to be realistic as to which method(s) make sense for your business and which one(s) your buyers actually look for. *Originally published May 2017. Information has been updated January 2018. The best way to rank on Google is to create content tailored to your specific buyer persona. Download our free Buyer Persona template to get started creating yours.